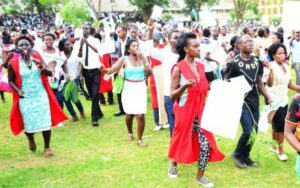 After a bitter campaign last November between Gen Mugisha Muntu and Patrick Amuriat, the Forum for Democratic Change (FDC) party finds itself locked in yet another battle in the Makerere University guild elections. The ideological differences have left party camps at the university split with infightings ahead of the guild elections. At Makerere University Business School –Mubs, Mr Ahabwe Tonny the FDC Mubs Chapter president, who doubles as the party flag bearer in the Mubs guild race has decried the crisis saying the infightings at national leadership has continued to severely affect the party at university levels. He says after the party primary elections, individualism and infightings emerged and caused the party to split, which he says is going to cost them the guild seat. “Individualism, betrayal and self-centeredness are eating up the party. It is too much here, there is less love for the party because many now front their personal benefits rather than party benefits. This is going to cost us yet FDC needs victory at such levels,” he said. Ahabwe added that, for many months, they have been seeking for help like a party reconciliation meeting from national leadership, all in vain. “If they keep looking at such things as small, our party will always lag behind because these are the roots, they keep watering and pruning at the top, yet we are rotting down the roots,” Ahabwe added. For Makerere University FDC chapter, politics of personality cults, intrigue, betrayal, and mistrust have characterized the campaign season .The race for choosing a flag bearer for the Chapter in the forthcoming guild race has left the divide even wider. It is alleged the on February 9, FDC members at Makerere organised a secret meeting at the university’s guest house and elected the new executive minus other delegates including Ronald Ainebyona, the former party Chapter president. Others who missed the meeting include senior party member, Edmond Kahiigi, a man that has been incarcerated uncountable times for his party. Kahiigi allege that the party constitution was violated and he is yet to communicate his next move. This has created a dilemma in the party chapter as it continues to split and majority have decided to pursue their political careers elsewhere. Speaking to PML Daily, Walid Mulindwa, the FDC youth league national mobiliser trashed the allegations that the party is split, calling on all members to remain calm and build the party. “The party is not split as stated in the media, but we all know is that campaigns are emotional. Let those who complain about the voting process write to the [FDC] youth league, we shall handle if they are not contented,” Mulindwa said. He said they are going to organize party reconciliation meetings in different universities to reunite party members. “We already had a party meeting in Kyambogo [University] and I am aware on Monday they there is going to be a meeting to see everything solved,” Mulindwa added. However, for Ahabwe it seems late because the guild elections for the Nakawa-based University is to be conducted in weeks from now and according to him, if the party does not intervene, he sees no miracles for his party to win.